DNA analysis has been undertaken about the ancestors of the Shih Tzu. The analysis showed that there is actually some connection to wolves! Geographically, these dogs seem to originate from China around 800 B.C, but there is some speculation about their origins. 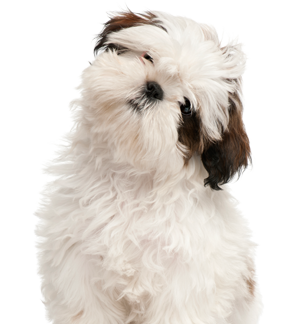 Shih Tzu is also known as Chrysanthemum dog or Lion dog and it is a toy breed. Why are Shih Tzus called Teddy Bear Dogs? Teddy Bear Dogs - they are pooches that can be mistaken for stuffed teddy bears. Surprise, surprise, the Shih Tzu is a tiny dog and its coat is soft and fluffy meaning you’d be hard pressed to differentiate it from a teddy bear. Specifically, when their coat around the head is cut in a round, fuller shape they look just like a teddy bear! Many years ago, Shih Tzu’s were seen in Chinese paintings and back then they were called Lhasa Apso. They were also favorites to the then royal families. They were held in great esteem and the Chinese didn’t want to trade or sell them. They were brought to Europe for the first time in the 1930s when they were renamed to Shih Tzu. They were introduced to the U.S.A. after the Second World War by military soldiers. The Shih Tzu can be found in eight solid colors, namely brown, white, black, silver, gold, red, liver, brindle and blue. Many Shih Tzu’s coat will include a mix of these colors, such as black and white, black mask gold, liver and white, solid liver, solid black, red and white, brindle and white and gray. That’s quite a mouthful I know! But it gets more in depth. There are a variety of unique Shih Tzu markings that, coupled with their colour combinations, determine the type of coat they have. And - wait for it - the colors may also change over time! That said, we suggest you head here (https://www.miracleshihtzu.com/shih-tzu-coat-colors.html) to check out all the details of a Shih Tzu’s coat because we think they sum it up better than we can. Some characteristics that you will find in each and every Shih Tzu is their affection, loyalty, alertness and the need to head outside whenever possible. They are known to be stubborn, but like any other dog, proper training at young age means they will learn to behave as they mature. Alike other teddy bear dogs, Shih Tzu’s are active and alert and as such they make for excellent watch dogs. Shih Tzu’s are very lovable, preferring to be close to their human companions. They are docile, friendly and connect with everyone - adults, children and other dogs alike. They also like to offer their affection to strangers which is a welcome sight when you’re at your local cafe or in the park. Back at home, they don’t require much space so they can live in an apartment without any issues. But just remember they love to get outside! The Shih Tzu is a small dog with dark, large eyes and a short muzzle. They grow to 10.5 inches (26.7 cm) in height and their weight varies from 10 to 16 lbs (4.5 to 7.3 kgs). They have a double coat which is long and soft. They also have long fur on their ears and their tail is heavily furred. The median life span of a shih tzu is the grand old age of 16 years and 4 months, but here are a number of health issues to watch out for including:breathing problems, intervertebral disk disease, hypothyroidism and eye issues. Just like any other dog they require good care and health check-ups. The coat of straight, fine and silky Shih Tzus is known to be hypoallergenic.